There’s nothing better than drying off with a fresh, soft towel. Your aim should be to give your guest that feeling every time they dry themselves. Over time, even some common practices will damage your towels. 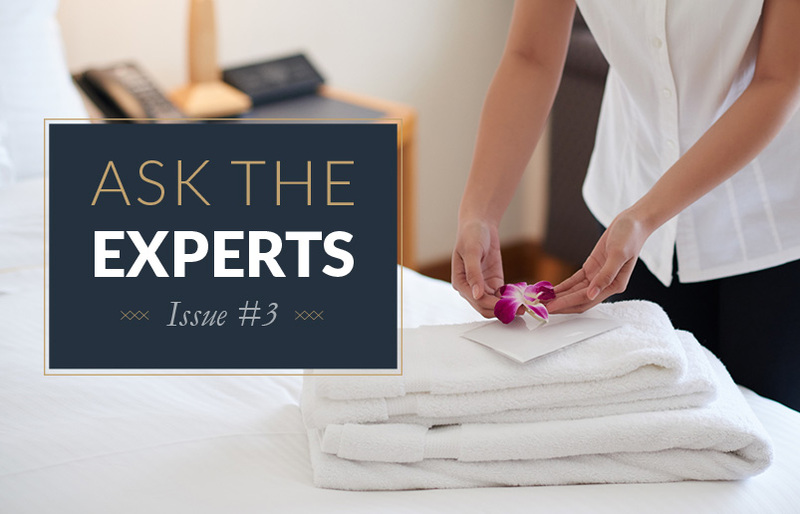 Our Linon team of experts have put together years of accumulated knowledge to consider when caring for your hotel or guest house towels. These towel care tips will help you keep your towels feeling like new and provide comfort and absorbency for your guests during every use. You Are Using Too Much Fabric Softener. Fabric softener decreases absorbency in towels. When towels lose their absorbency, they can get a waxy residue that will lock in odours, making your towels smell like mildew. While using it is okay, don’t overdo it and make sure to dilute with water. It’s also recommended to skip the fabric softener occasionally. Don’t Over-Dry Your Hospitality Towels. Mildew can be the result of not properly drying your towels so you might be inclined to dry your towels on the highest setting possible for a longer period. This can cause the towel fibres to thin and cause your towels to lose its ability to absorb correctly. If you are using a laundry service, check up on the time and temperature they are drying your towels. They could be making a costly mistake they are making on your behalf. Cycling Through Your Guest House Towels. For any hotel or guest house, it is vitally important to have enough sets of towels that you can rotate them properly. You’re going to use and wash towels more often with one or two sets; this causes the towels to lose their absorbency and softness faster than one would expect. This will give your guests a less than perfect drying experience. Use Half The Detergent Amount. When washing towels, use half the detergent recommended for a regular wash. Too much soap can damage towels and lose their fluffiness. If you are washing luxury towels or extra delicate towels, be sure to use a detergent labelled mild. Get Fabric Softener Alternatives. If you’re skipping the fabric softener, you’re still going to want something to keep your towels feeling soft. You can purchase some dryer balls or even use clean tennis balls. While your towels are drying, the balls will bounce around the dryer. As they do this, they get rid of lumps in the towels and help fluff them. Let Your Guest House Towels Breathe. Just like us, towels need to breathe! This applies to all aspects of towel use. After you dry off, hang it up so it can dry. While hooks are okay, a towel bar is better because the towel can lie flat and air-dry evenly. After you take them out of the dryer, consider hanging them on a clothesline outside. Bright sunlight and fresh air are fantastic ways to keep your towels smelling, looking and feeling like new. One area that people tend to overlook is the linen cupboard. Your guest house towel storage space is just as important for keeping your towels fresh. Give Your Towels Space. This might sound like good relationship advice but it works well for towels too. While you might want to keep all of your towels and linens in a cupboard, make sure you’re not overcrowding them. When there is poor air circulation, your linen cupboard can start to acquire an old, musty smell. Towels stay fresher and smell better when they have access to air. Keep Your Guest House Linen Cupboard Dry. Your towels should be completely dry when you put them in the linen cupboard. Moisture can add to the musty smell and start bacterial growth in the dark spaces in the cabinet. Rotate Your Guest House Towels. Put your clean towels under the towels that are already in the linen closet. This way, you’ll keep the towels rotating in the linen cupboard. Towels that sit for too long can get musty and stale. One easy way to keep track of your towel rotation is to use colour-coding on your towels care tags. If you think your towels are in need of some care, there are ways to bring them back to that newly purchased fluffy and vibrant state. Get Rid Of That Musty Smell In Your Towels. Sometimes laundry detergent isn’t enough to get rid of the bad odour in a towel. If your clean towels still smell, then you can try a vinegar and baking soda rinse. This method will get rid of residue that can trap odours. Load your towels into the washing machine and add a cup of vinegar where you usually put the laundry soap, no detergent is needed. Wash the towels in hot water. When that load is complete, leave the towels in the machine and add a cup of baking soda. Wash the towels in hot water again and dry them with a low heat. You will be amazed at the results. New Towels Don’t Dry Well. Hospitality towels have a coating that makes them feel soft in the store and preserve the colour. Unfortunately, this coating also makes them less absorbent. You’ll notice an increase in absorbency after they’ve been washed and dried a few times. So, don’t worry that you bought dud towels, just give your towels time to lose this coating and they will soon start to provide comfort and absorbency for your guests. Are you ready to get towels that are absorbent, fluffy and luxurious? Linon has ample stock of Nortex Snag Free White 485gsm, Nortex Snag Free 600gsm and Nortex Indulgence 630gsm. All you have to do is select the towel, size, range and you’re on your way to getting high-quality towels. The Linon collection of hospitality linen has be specifically tailored for the hospitality industry and has been developed by our team based on over 120 years of combined experience. If you would like to ask any of our experts about your establishments correct par level for bed linon or any other linen query, please give us a call on +27 87 550 0202 or email info@linon.co.za. What is the appropriate amount of bed linen I need for my guest house?